Each year the Teen Librarians at KCPL, BCPL, and CCPL get together to host an event celebrating anime, cartoons, and comics! In the past it was known as NKY Cosplay, and is now called NKY FANDOM FEST! Fans of everything from Death Note to Dr. Who, Adventure Time to Avengers, Homestuck and Hunger Games are welcome! Costumes are not required for the event, but you do have to be in middle or high school to attend. 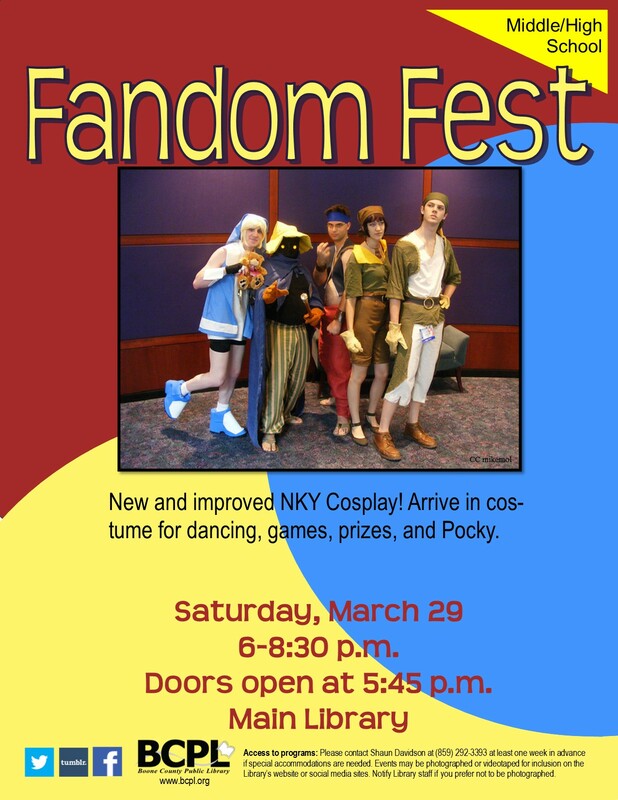 NKY Fandom Fest is Saturday, March 29th from 6-8:30 pm. at the BCPL Main Branch. Doors open at 5:45 pm. At Fandom Fest you can expect these events and activities! To register and stay up to date with event details check out our Facebook page!